The whole is more than the sum of its parts (Aristotle). As a marketing leader, you don’t want to just make an impression, you want to show your impact. Let’s cut to the chase: as Chief Marketing Officer you need metrics and results. Otherwise, there is no glory – and no budget or resources for you to help your company succeed. Setting KPIs is today’s mantra for everything you do. But agreeing on which KPIs are relevant is not that straightforward. So, how can you fulfill all these expectations while controlling your urge to count leads, conversion rates, clicks, opens, and number of attendees at your events? I am guessing, that this is how you judge your success as a marketing leader today. But other stake holders expect different measures, and nothing is more frustrating for a marketing leader than happily reporting marketing results and then being ignored/unappreciated by the organization. The dilemma is well known – there are countless “How To Measure Marketing Success” do-it-yourself books, articles, videos and blogs out there for you to sample. But from checking 10 different sources, none of these provided an answer to all of the above. Most – and that makes sense – are focused on the expectations of Sales in order to support creating revenue. But remember, Sales is measured on short term goals, and your CFO wanted your plan in place 12-18 months before it is supposed to be executed. When convincing CFOs, CEOs and board rooms, the trick used to be to show complex pivot tables with an abundance of data that hopefully illustrated achieving your KPIs. 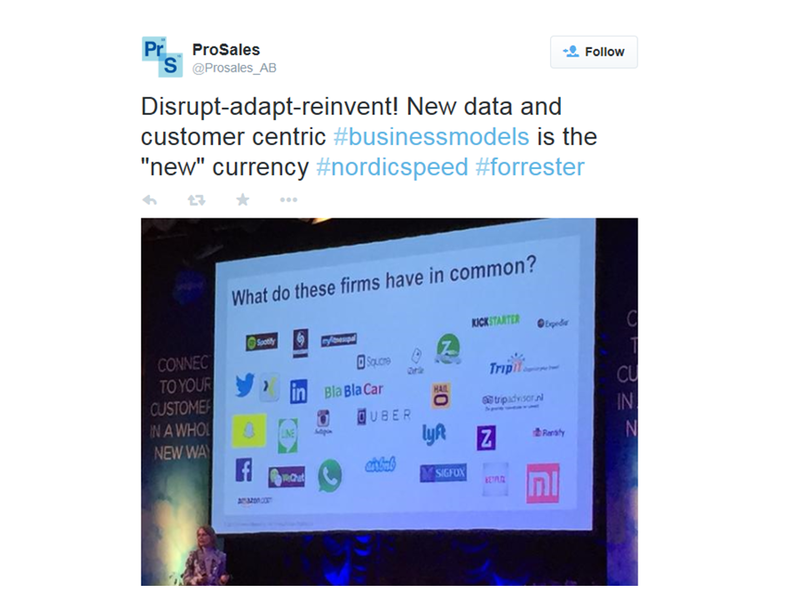 But times have changed, and speed is the new currency of business. You only have seven seconds to make an impression. But knowing that your counterpart only has a slightly higher attention span than a goldfish, you have about eight seconds to make an impact. It has all the components you need in order to assemble the various parts of the elephant. The dashboard reports on budget, progress according to plan, activities planned and status, and much more. You can slice it the way you want. The application is called Marketing Performance Management (MPM) and is developed by one of Sweden’s exciting startups, Musqot Marketing Technology. The benefit of an overview like this is that it takes only 8 seconds to process during a meeting where the CMO holds the last spot and only has 12 minutes left from the 20 minutes she was allocated on the agenda. Another clever aspect is the fact that it provides a holistic view of marketing execution, based on real time data. For example, the planning section is built upon the familiar concept of Gantt charts while in the same view you have the updated results from the various activities displayed at the bottom – taking Gantt to the next level so to speak. Musqot’s current tagline is “Control Will Unleash Creativity” and speaks to exactly what marketing is all about in the enterprise: being able to creatively support the strategic objectives of a company while maintaining control over planning, budgeting and execution. 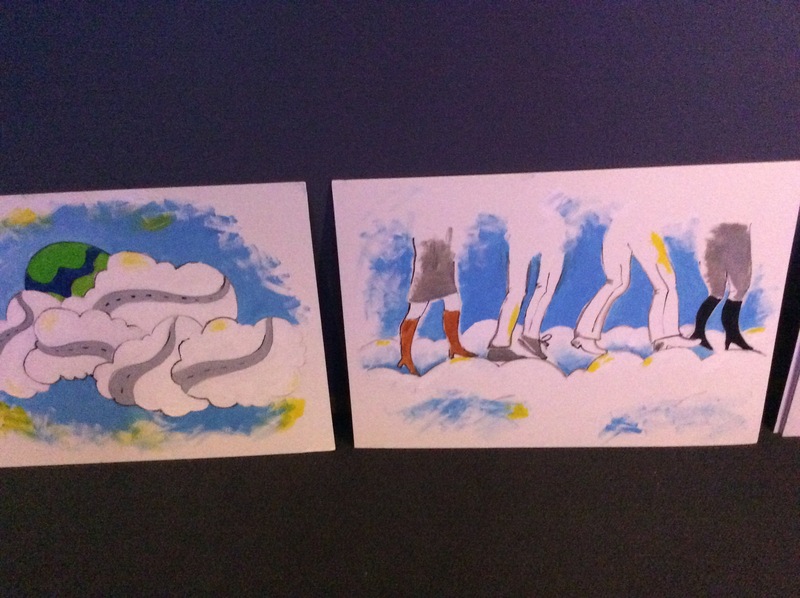 So, basically you are combining the parts of the elephant into … a whole elephant … rather than a snake (the trunk), a spear (the tusks), a piece of rope (the tail) and a leathery sheet (the ears). If you want to visualize data driven planning, progress and results, you need to have the data available in a consolidated environment where the various sources are seamlessly integrated. Despite being the ultimate tool for marketing finance and performance management for the enterprise, you will unfortunately need to reside and consolidate everything on the Salesforce platform. It’s not an easy nut to crack, but to work with data means that the data needs to be compatible regardless of its source. 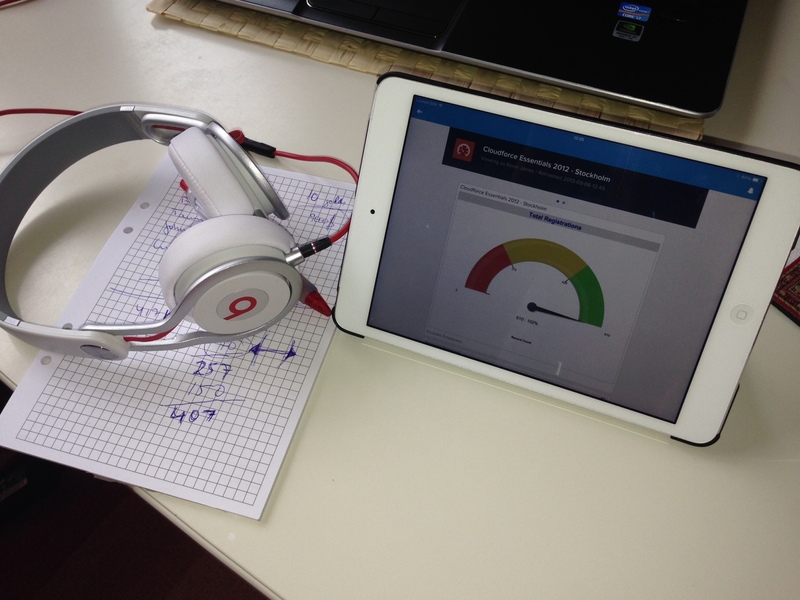 Especially if you – as in this case – have real time visualization and insights to gain. So, to reap the benefits of the ultimate CMO dashboard, you would need your data to be sourced from and consolidated on the Salesforce platform. Which is why Musqot is a featured application available on the Salesforce AppExchange. But if you measure – and show – marketing success in a format that ties it all together like this, where activities are directly associated with sales success, the sales manager may just stop asking you to organize huge events and request more long time planning and engaging campaigns that are timely based upon the actual needs of the future customer. So now both Sales and Finance recognize your marketing success. By consolidating your data, your activities and your results on one platform that is integrated well into the company’s IT backend, the CIO will recognize the success of your marketing activities. And if everyone else is pleased, so is your CEO. Especially since you did not bore her to death, and succeeded in presenting your update within the eight seconds you had to make an impact. This was the most retweeted phrase of the entire session, delivered by McKinsey speakers at the Salesforce Speed of Change city tours across the Nordic capitals. When you evaluate the steps needed to win in today’s fast changing markets and business environments, it becomes clear that your company must focus on what you are really providing. Not what you think you are selling, but what your customers need to fulfill a basic need. Regardless of whether you are in B2B, in B2C or a government or non profit organization, take it one step further and you can learn from the winners of the past. 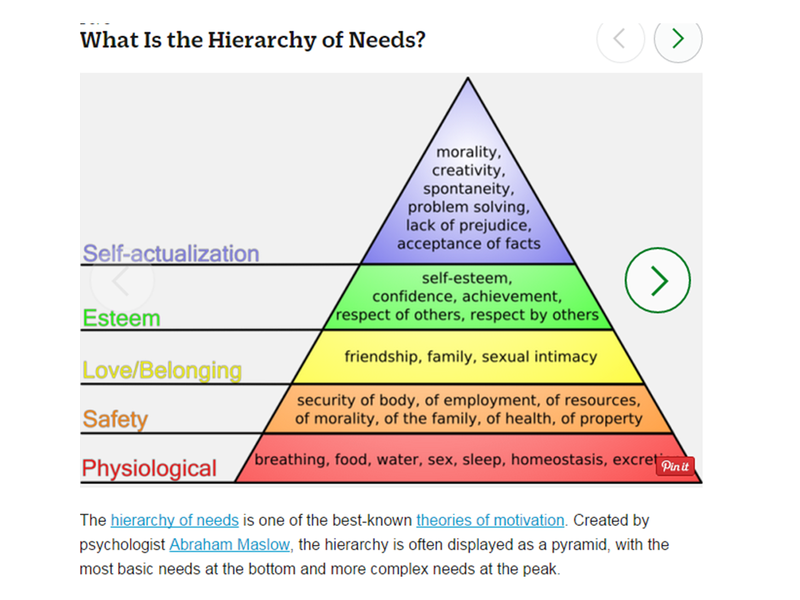 Remember the Maslow pyramid of basic human needs? Try to match them against the game changing technologies we see today, and you will see that the main driver behind change is not technology itself but what it can do for you. The privileged among us are catered for at the bottom of the pyramid. That’s when “social” takes over. The success formula behind all social networks is not that they deliver an app to your mobile device. As Martha Bennett from Forrester suggested during the Speed of Change Nordic City Tour: “You sell the outcome not the device or the service”. Social networks have changed the way we do business, the way we connect in our professional and private lives, and the way machines and devices are connecting simply because they use data to fulfill the needs at the top of the pyramid. Through the mining of this data technology – by making your data speak – vendors and disrupters in the digital world provide a sense of belonging, help us to gain respect for our achievements and put ourselves at the centre. Which – by the way – is why we manage to survive from the moment we are born and make the first fierce cryout for food and comfort. There are many examples of industry or market disrupters but despite being disruptive in their day, they do not necessarily survive and thrive, as competitors catch up and technology evolves to create new patterns of behaviour in business processes. If you look at the companies that have changed an industry, such as how media is consumed or how basic grocery goods and services are delivered, they successfully disrupted because they catered to a basic human need. 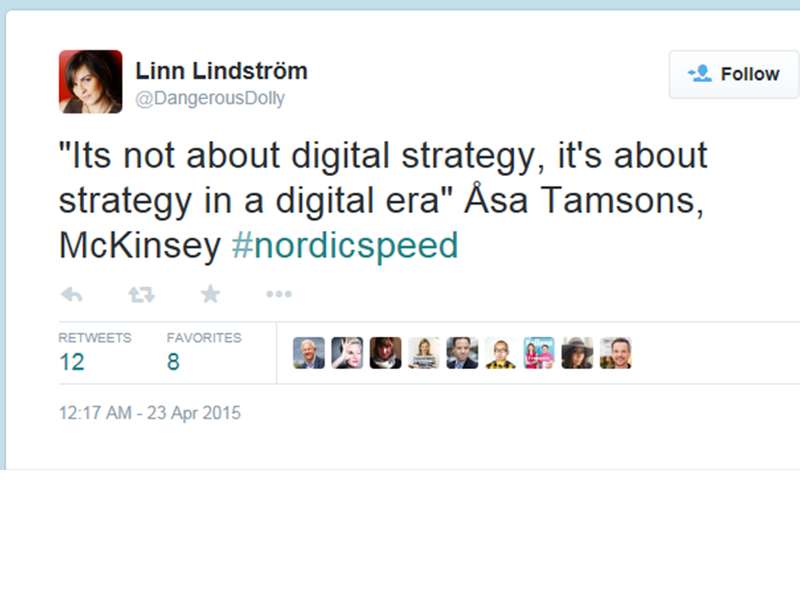 So what is your strategy in a digital age? Disrupt, reinvent, adapt – or be disrupted. ** It’s as simple, or complicated, as that. Human civilization emerged from tribes – as individuals the early humans would not have survived. The same applies today . No one can survive in a silo, be it a company, an industry, an organization or a department. Once you realize that, you understand the power of relationships as the foundation of successfully connecting your needs to those of others upon who you are depending. That is why the current mantra in modern marketing is engagement. Every process, every action, every transaction is connected. If you push, someone or something has to move backwards. If you pull, someone or something is moving towards you. Pushing and pulling at the same time creates engagement. When you engage your audience, your partners or your employees, you create a tribe. 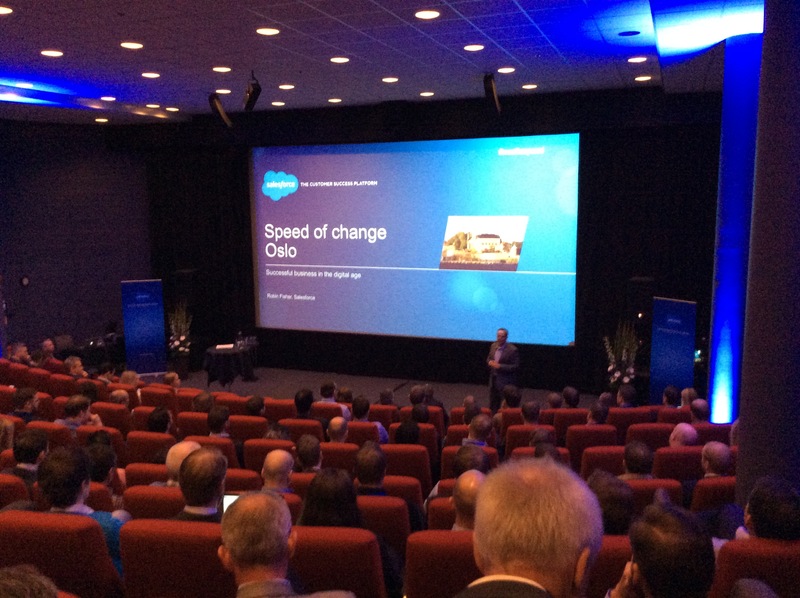 At the Speed of Change event in Oslo on April 16, 2015 (organized by Salesforce), trendspotter Arnt Eriksen focused on the power of tribes that develop into movements which ultimately could change the world. You could claim that the Arab Spring – using Facebook as it’s vehicle – started as a tribe and ended as a movement. Similary, Apple started building a tribe, a community of followers who wanted to think differently about computing. And ended up changing the world by engaging with them, changing them into devoted followers (tribes) and making them it’s strongest, devoted and forgiving ambassadors. When you have a purpose that can unite your tribe – such as the Arab Spring – and you have the vehicle to engage with each other – such as Facebook or other social channels – you can become successful as a business in the digital age. Companies that are able to anticipate their customers’ needs have a clear advantage in our world of rapidly changing customer demands. Speed is of the essence. Companies across the world are looking for ways to understand not just what has happened, but what would happen next so that they can meet the customer without having to cross a divide. The challenge is how to adopt a framework that provides the platform for speed. Everything is becoming more and more connected. Many call this the internet of things, but we could also look at it as simply an opportunity to connect with our customers in a whole new way, an Internet of Customers. In fact, over 75 billion things will become connected by 2020, and this leads to trillions of customer interactions. Each interaction represents a data point, a piece of history that can be used to understand what will happen next. Today, retail companies like Rossignol create a social profile of their customers to offer services like modifications to the equipment to help the skier’s performance, or a training regimen based on his actual use. Hospitals want to track patient behavior – from patient activity levels to blood pressure to help provide a better standard of service and care. And energy companies are collecting data from big machine performance, or seismic activity and weather data to try to get more effective at preventative maintenance of their oil rigs. It’s using the data to predict the future which should be the foundation of the Big Data hype. Companies want to transform how they sell to a customer, deliver better service, create targeted campaigns, build better products, optimize operations. And business people need the right insights to take action, instantly. It wasn’t planned, but necessity made it happen: stuck in extremely busy times working entirely off the iPad (and a mini at that). So what’s all this about mobility, on any device anytime, anywhere? Can we be productive? Slightly longer answer: read my notes below to understand what worked, how it worked, and what didn’t (at least for me). By the way, I am sure if I had had the bandwidth to search for solutions/apps when I encountered challenges, it could have been solved. But I didn’t. Simply too busy. So I invented new ways of getting things done. My plan was to stop carrying my laptop when travelling on short business flights for meetings – the iPad mini fits into the handbag and does not even have to come out when passing through security, as it is seen by the scanner as a mobile telephone. So I downloaded Office-To-Go from Nexscience and created my first document during a flight which I could later email to myself, edit and forward/send to the people I wanted to email. Creating a straight forward text was easy and intuitive and it did not reformat when moved between applications. Getting back to the office, my laptop – died. No time wasted, turned to Chatter on the Salesforce1 platform on my iPad to update my co-workers on the project in the appropriate Chatter group. It saved me having to write meeting notes! In fact, I could share more information more directly – because you get lazy when you have to type it all on the small iPad mini keyboard. Within 20 minutes, all the details discussed in the meeting were shared with those co-workers working on the project who would then be alerted to them in their Chatter feed. Productivity indicator – saved 30 minutes – no need to organise your notes to write a structured report. And immediate sharing, instead of another dreaded set of meeting notes lying around that need to be written “when you have a moment”. And then I logged a ticket with our IT hotline – also in Chatter – to get help fixing the laptop. Obviously, as I could not log it from the laptop. Duh… Considering I work offsite (#anywhereization) and it being a hardware issue, I braced myself to be stuck with the iPad for at least another day. Opening emails as the first thing you do makes little sense if most of the interaction you have is in the Chatter feed – including just getting an overview of what happened overnight in a global company that never sleeps. Working on the iPad mini means you can work everywhere, so why not right there with coffee and a toast without even getting up – and it is not nearly as uncomfortably hot as a laptop on your knees. Who hasn’t had a “laptop-burn” on their thigh at some point – or fried a battery charger under the covers. You end up working in the most awkward positions. Productivity indicator – Down at least 60 minutes, as I should have been up and in the office instead. In preparation of a new project briefing to be kicked off in a conference call later that day, I had planned to create a fabulous Powerpoint slide deck with nice images, amazing graphics and charts. But that was not an option with just your index finger and an iPad mini screen size. So I opened Keynote which I knew was a cool app. But since I am not a Mac-User (yes, my laptop is in fact a PC) I never checked it out. Now was the time. It took some trial and error, and I never figured out how to import the cool graphics and charts and nice images. But all the information needed for the briefing suddenly fit into 5 slides – just text and itemized lists and links to other sources of information. No fancy stuff that is nice to look at but not really carrying any information. Keeping it simple also gets the information out. Productivity Indicator – Saved 60 minutes of searching for the perfect graphic, the perfect photograph, creating the perfect pie chart and reformatting into the perfect colour scheme. But what about the conference call? We mostly use GoToMeeting so that was a fast and free option to download to the iPad and then log into my existing userID. But I never figured out how to schedule a meeting for later, so had to open one in meet now and then let it beep in my ear until the meeting started 20 mins later. I experimented to be sure it all worked once the co-workers were joining to save everyone the frustration of a failed conference call, but it meant I had to live with the beep. Honestly, folks at GoToMeeting, could you not give us some music, instead? The beep eats my brain cells. I had sent everyone on the call my fantastic Keynote presentation with only 5 slides for them to read, which was greatly appreciated – so it all started off on a really nice note and we had the most agreeable session where everyone agreed, and we agreed on who should make it happen: me – but that’s another blog, I fear. Learn how to SCHEDULE a GoToMeeting on the iPad as soon as you can to avoid the beep. Productivity Indicator – saved 30 minutes, as everyone had the clear, short itemized briefing and we did not share any slides on the call to go through in presentation mode where everyone wants to comment (at least in Sweden) and knocks you off track. No questions asked = agreement was quicker and based on the facts only. Laptop fixed, off into the office to plug it into the docking station…. and it died again. Motherboard fried. Back to the iPad. My eyes were swimming – also because the iPad mini screen is so small that it is really tiresome to work for 8 hours squinting like that. By now, I found myself checking Salesforce1 notifications continuously rather than checking emails – it is just quicker to get the issue/request sorted within the app, so that any links to information that is already part of Salesforce is there without having to copy/paste it into an email. As a matter of fact, I find copy/paste very difficult to execute on the iPad – maybe my fingers are not the right size. All is not well when you really need to get your head down to business, though. When a process is not designed intuitively for the mobile interface, some things just cannot be done. Such as updating Google Docs. Painfully, I realised that I had to start writing apologetic Chatter posts to my co-workers that dealt with the more logistical aspects of our ongoing projects – you know, budgets and stuff. The beauty is, that the apology posted on one co-worker’s Chatter feed actually resulted in two others reading this post and offering to help with completing all the steps that I cannot currently take care of from the iPad. So – in fact – I did not ask for help, but help was offered. And saved me the humiliation of casting the towel and delaying the process impacting everyone in the chain of events. Running complicated projects on a tight timeline requires a well oiled machine where every link is the strongest link. And I am the weakest link when unable to complete my own tasks. Until all business processes are intuitive and integrated in the mobile interface – not just VIEW but also CREATION, you need friends when stuck on the iPad. 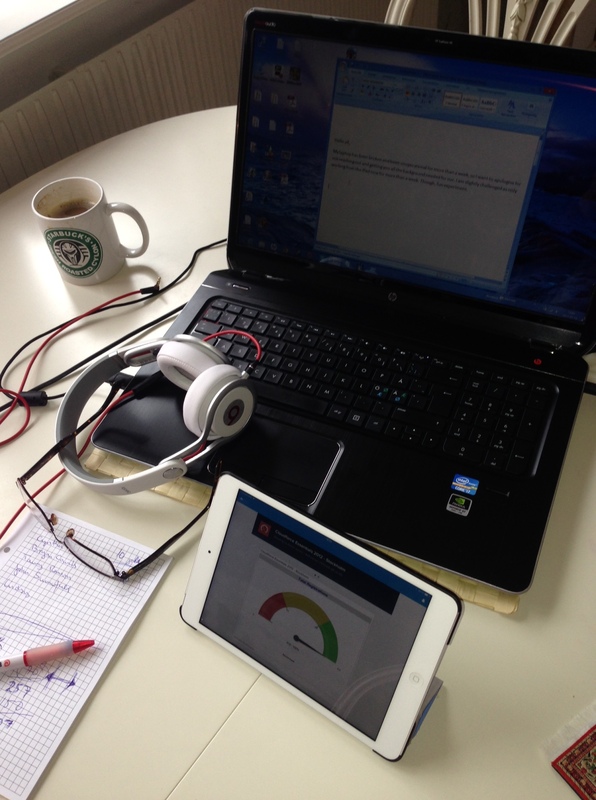 ProductivityIndicator – Lost at least one full day in the progress of the project. Not a good thing. Waiting for my replacement laptop got me another day on the experiment – and made me realise that a big screen is probably a better choice when I need to write more than just a few brief messages. So I ended up working in a hybrid – and perhaps a little less smart – but hey, it worked. My private laptop is big – really big. I use it for playing computer games. You need a big screen to find all those monsters in the dark. Today, I created long documents (including this blog) on this fantastic device with a proper keyboard and ergonomic mouse – and emailed them to my company email to process on the iPad either as another email now going where it was supposed to go, or as a briefing/post in Chatter. It’s backwards, but at least my eyes are not swimming. And easier to make sure there are no typos – or unintentional bloopers – in the information that I share. ProductivityIndicator – Minus 50% productivity on the day, having to send documents back and forth between devices and formats requiring reformating/editing. Looking forward to my laptop tomorrow, you are still my best friend. But iPad Mini – you saved me and will always remain close to my heart. Or in my handbag. Please excuse any typos – as this was proof read on an iPad Mini. Hur öppen, flexibel och användbar är din plattform? Hur ofta behöver du uppgradera dina affärssystem, och när det väl händer: är det synkroniserat så att alla är uppe och på samma version på samma tid? Diskuterar ni Cloud teknologi vid fikabordet? Utvecklas dina lösningar till mobila devices, eller måste du vrida på surfplattan för att få med hela interfacet, eftersom det var byggd för en datorskärm? Kan du uppdatera dina kundmöten, godkänna fakturor, bygga workflows medan du springer över gatan mitt i Stockhkolms-trafiken? På din mobil? Det är så man tänker på salesforce.com när man utvecklar lösningar för affärshantering i molnet. Det var Cloud Computing som gjorde det möjligt, men det är vi som får det att hända. Du och jag. Om man verkligen vill förstå hur allt detta spelar ihop – hur teknologin används för marknad med smarta verktyg byggd i och för social, som säljverktyg och som connected kundservice – då kommer salesforce.com faktisk att bjuda på gratis inspiration. 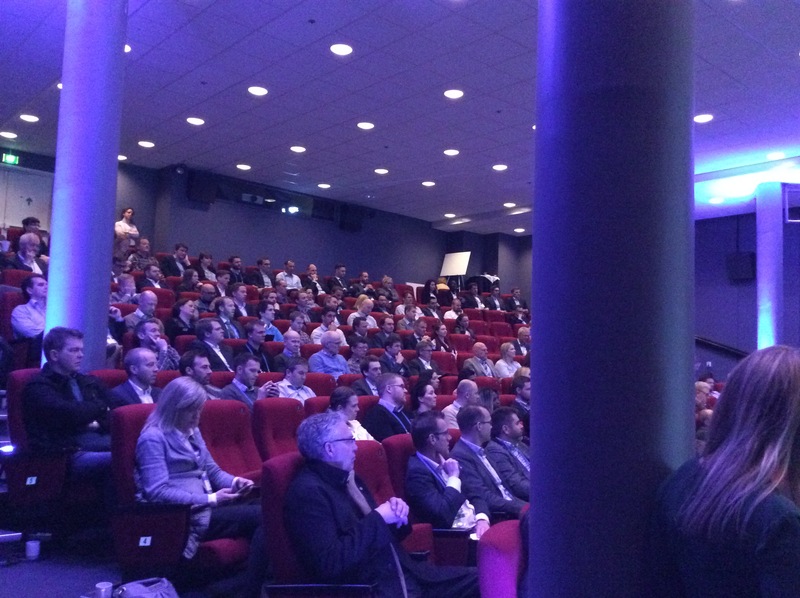 Den 15 oktober på Grand Hotel i Stockholm hålls Customer Company Tour Nordics – en gratisk heldagskonferens (på engelska) med runt 30 utställare och keynote och eftermiddagssessioner där kunder berättar om hur de använder teknologin, hur de skapar nya verktyg eller bygger egna appar på force.com plattformen, och helt enkelt har mera kul. Huvudtalare är Erik Hallberg, VD för TeliaSonera International Carrier som bygger sin IT arkitektur på force.com plattformen och använder Salesforce både som internt collaborationsverktyg, i sälj, marknad och kundservice. Och Line Dahle från norska marinförsäkringsbolaget Gard AS – ett 120 år gammalt traditionellt företag som nu jobbar i molnet med kommunikation, intern kollaboration och hantering av ärenden och kundservice. För speciellt i den branschen måste man kunna respondera snabbt när det smäller till på ett skepp någonstans ute i världen. 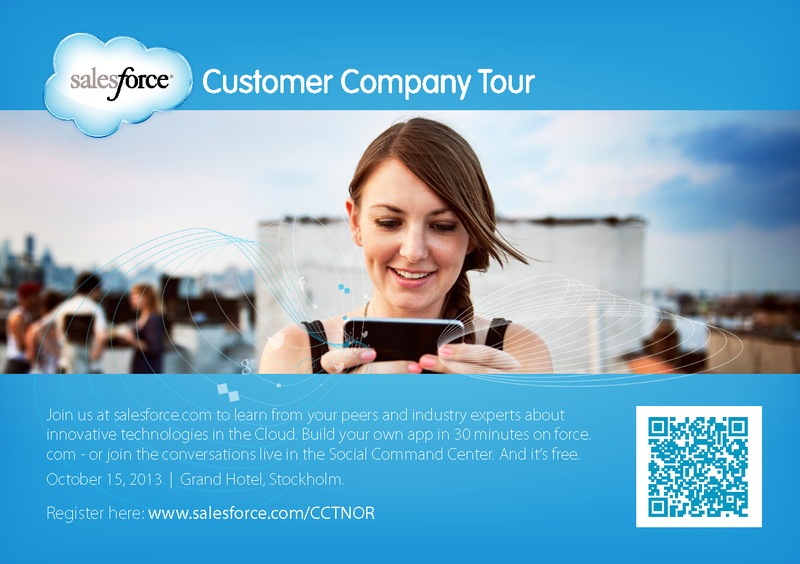 Dessutom kommer det finnas demo stations, så att man kan testa själv eller få en av salesforce.com’s egna utvecklare visa. Och session som omhandlar allt från hur President Obama vann valet med hjälp av Salesforce och sociala medier till hur stora företag flytter hela sin verksamhet till en mobil, öppen, social plattform för att möta kunden där kunden är. Du kan registrera dig här – det är gratis.